LVR is an acronym that stands for Loan to Value Ratio. It is the proportion of money you borrow compared to the value of the property, and expressed as a percentage. Lenders use this to help assess the risk factor of borrowers before deciding whether to approve a loan. In this example, the value of the property is $400,000 and a deposit of $40,000 is available. 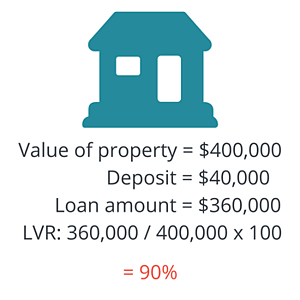 A LVR of 80% is considered to be a benchmark for many lenders, above which you may have to pay extra fees, including Lenders Mortgage Insurance (LMI). LMI protects the lender in the event of a customer defaulting on a home loan. How will the LVR affect you as a property investor? Lenders place a large emphasis on the LVR. As well as influencing whether or not you will have to pay LMI, it can also impact the interest rate you will be paying on your loan. The lower the LVR, the lower the lender's risk, which can result in the customer receiving other benefits such as lower interest rates or reduced fees on their loan package.